Banstead Botany Blog: Ghost Orchid back but bad timing for some! 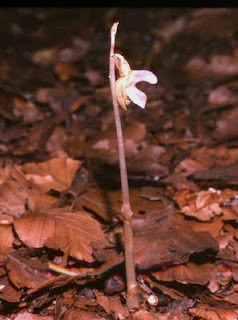 It is good to hear on the grapevine that Ghost Orchid (Epipogium aphyllum) has been seen in flower in the UK this year. It will apparently be officially announced at the BSBI in November but its location will be kept secret, I hope for a long time. For those who don't know, Ghost Orchid, as its latin name suggests has no leaves and also no chlorophyll. It is what used to be called a saprophyte, a plant living on decaying matter. We now know that such plants usually have a complex symbiotic/parasitic relationship with associated fungi and surrounding trees. It has only ever been known from three or four sites in the UK and can survive for many years underground without flowering. It hadn't been seen officially for 23 years and in fact it had been declared extinct last year even though it had disappeared for similar periods earlier in the twentieth century. I was lucky enough to see the plant flowering in the Chilterns back in the nineteen seventies and eighties, (hence the poor scan from a slide) when it flowered almost annually for quite a few years. It seems the habitat has got considerably drier over the past twenty years and it was assumed that it had gone forever. However apparently not, great news! The Ghost Orchid Declaration: Saving the UK's wild flowers today. which they lead on the fact that Ghost Orchid had been declared extinct!! Unfortunate. I have not read it fully yet but it seems to be an important document highlighting the problems of conserving habitat for plant and fungi species. Regardless of Ghost Orchid, many plant species are seriously threatened so lets wish them all the best. I recently read that Prince Charles had officially announced that the ghost orchid was no longer found in England! I am so thrilled to know one has been seen. I was one of the first to see the only ghost orchid blooming in the Corkscrew Audubon Sanctuary in Naples, FL in July 2007 and was so obsessed I wrote a novel, Ghost Orchid, by D. K. Christi www.dkchristi.com about a family's love, lies and redemption wrapped in the mystical aura of that sighting. Do look up my Ghost Orchid as it has beautiful descriptions of its home in Corkscrew swamp. If you get a picture of yours, I'd love to link to it from my web site.